I've said it before and I'll say it again, my favourite time of the year in the Lush calendar is the winter. Between the Hallowe'en and Christmas offerings, there is so much on offer in store. 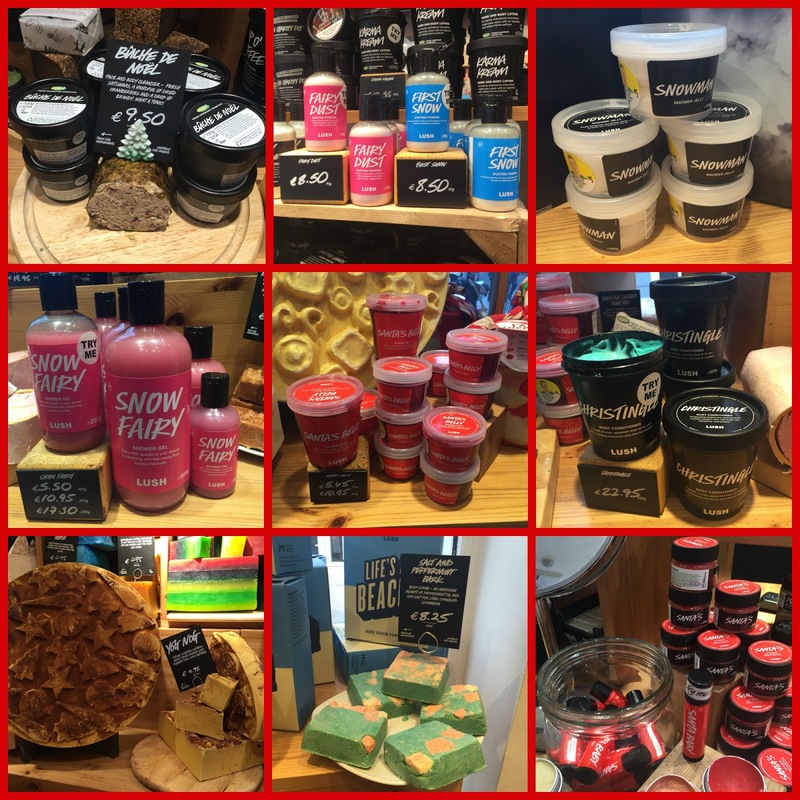 I was invited along to a press event last week where we were able to peruse what's on offer this winter in Lush and I've put together some photos just to show you and entice you in store if you are so inclined. I will also be following up in the next few weeks with a Lush Christmas Gift Guide to show you the kits and gifts on offer also. 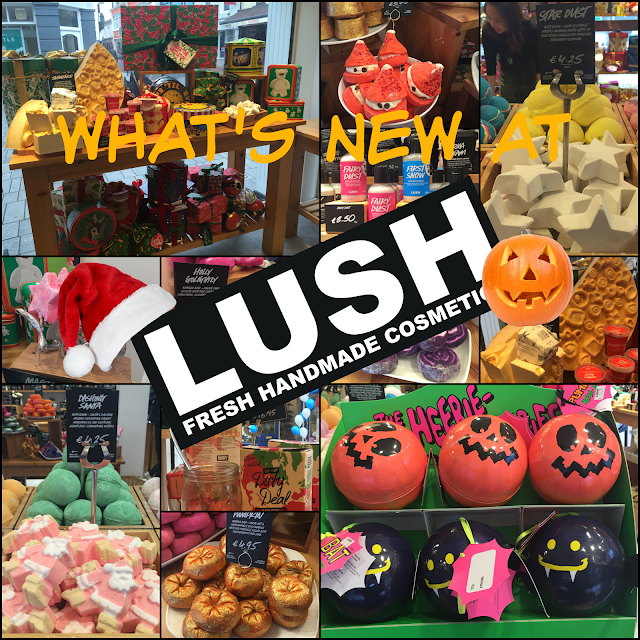 Firstly, on the Hallowe'en front, Lush have brought back some old favourites and introduced some new goodies to whet our appetites. They have brought us a new bath bomb and shower Scream going by the name of Lord of Misrule, a herbal blend of patchouli and black pepper oil and fair trade vanilla absolute. This line was inspired by the ruler if the pagan Feast of Fools and underneath the gruesome green exterior is a pink interior filled with popping candy. Our friend the Sparkly Pumpkin has made a comeback and is glitterier than ever - the bubble bar is not only covered in gold glitter which explodes into the water of your bath and contains juniperberry, grapefruit and lime oils. Keeping up with the spooky theme, Nightwing is a bat shaped shower jelly packed with lime juice, lime oil and aloe vera and leaves navy bubbles wherever you swipe this. 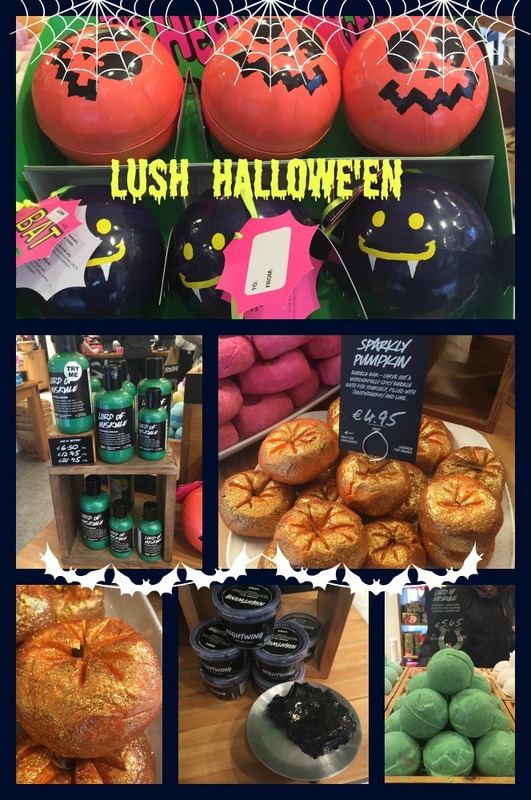 There are also two gift sets - Heebie Jeebie Pumpkin which contains a Lord of Misrule bath bomb and a Sparkly Pumpkin and a Heebie Jeebie Bat which contains a Lord of Misrule Shower Scream and a Nightwing Shower Jelly. 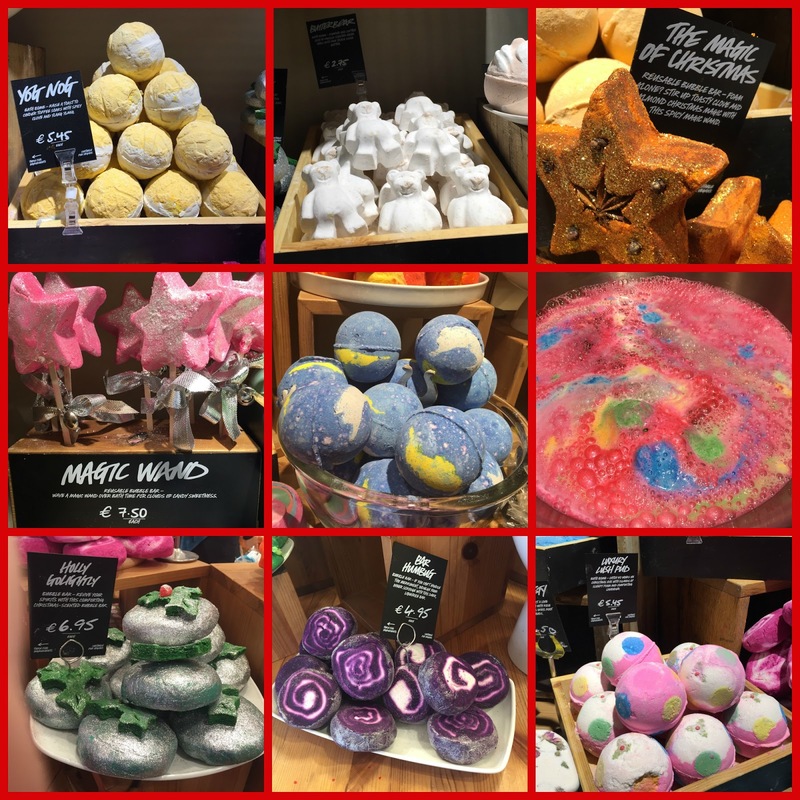 And then onto Lush Christmas- how I love Lush Christmas! I go for a bath pretty much every single night over Christmas and as some of the bath bombs are repeated every Christmas, the smells remind me of certain Christmas movies or family visits and the like. This year, Lush have delivered a-plenty again of the Yuletide front with a host of new and old favourites. Peeping Santa is a new addition to this year's Christmas lineup and a very cute addition it is too with the (dairy free) chocolate drop eyes and red edible hearts in a strawberry scented, bergamot and geranium oil infused cone. This bubble bar is packed with shea butter and cocoa butter to leave your skin feeling soft and nourished. So White was on the Lush Christmas menu last year also. This bath bomb is completely white on the outside, rosey pink in the middle and smells like apples with neroli and orange flower thrown in for good measure. Candy Mountain is from the Snow Fairy family - this in my mind smells the exact same as Snow Fairy- sweet, vanilla and gives you a bath full of pink bubbles. Cinders - my ultimate favourite Christmas offering, this is a gorgeous warm, fruity and slighty spicy bath bomb that is oh-so Christmassy thanks to the cinnamon leaf oil. The kids at Lush call this the smell of hot fruit punch and it's packed with popping candy that gently sizzles as you bathe. If you get no other bath bombs this Christmas, then just try this one. It is amazing! Star Dust is a combination of Ugandan vanilla and Peruvian rosewood and is packed with snowflake lustre and edible stars- this is not as glittery as last year's star shaped offering but is equally as spectacular in the bath. Snow Angel explodes in your bath into white foam followed by golden stream. This smells like marzipan with a tinkle of cassis absolute and rose and makes for the perfect softening soak. Five Gold Rings are five little bubble bar rings that you crumble under running water for a gorgeous golden soak packed with moringa oil, tonka, fair trade vanilla and gardenia extract. Dashing Santa is a gorgeous citrus scented Santa that releases orange flower, bergamot and mandarin oil for an uplifting, zingy bath. Golden Wonder is another zesty mood brightening bath bomb that's golden and sparkly on the outside but explodes into a stream of turquoise and gold glitter once it hits water. This was also one of my favourites from last year. Yog Nog is the bath bomb equivalent of the soap with the same name that we have come to know and love. This is a warming, creamy comforting bath that smells like toffee and releases gold lustre to deliver a luxe bath experience. ButterBear is a vanilla scented little bear infused with moisturising cocoa butter that provides a gorgeous softening skin treat, if you can bear to crumble up that cute little bear that is! The Magic of Christmas is warm and spicy reusable bubble bar thanks to the cinnamon, orange, clove and almond scents running through it. This is like a more grown up, wintery version of Magic Wand which is the Snow Fairy inspired bubble bar. Swirl either of these in the bath to get the bubbles going. Shoot for the Stars is another favourite from last year and contains those citrus fragrances of orange and bergamot oils. It looks blue on the outside but dissolves purple/pink and contains both silver and pink glitter and white hearts. Holly Golightly is another old favourite of mine and not only looks perfectly festive but smells it too- with cloves, cinnamon and patchouli notes, this festive green bath will do wonders for your soul. Bar Humbug is new this year is an unusual licorice themed bubble bar that smells like fennel and tarragon- I didn't think I would like this one at all because it sounds very, eh, savoury, but I have one to use so keep an eye on my Instagram for a mini-review in the coming weeks. Luxury Lush Pud is probably the most aesthetically pleasing of all the Lush bath bombs as well as one of my favourites. Packed with lavender oil, this is an amazingly soothing relaxing bath and it explodes a kaleidoscope of colour as you can see from the pic above. 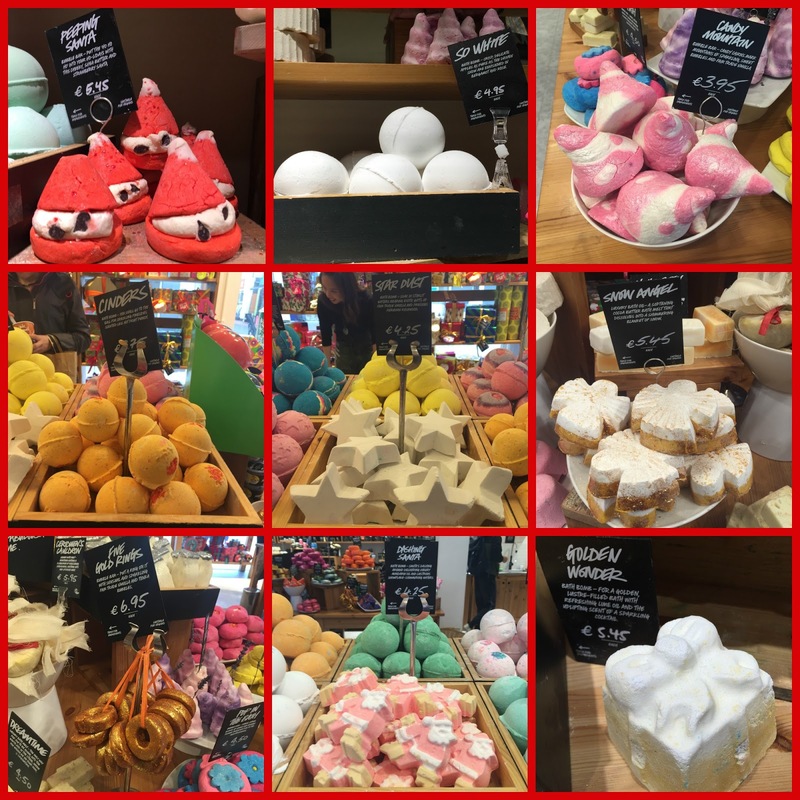 And for a selection of non-bath specific Lush Christmas cheer, there are face cleansers, shower creams and gellies, body creams, soaps - the works! Buche de Noel is a festive fresh face cleanser with satsumas, cranberries and a drop of brandy for good measure to buff and brighten your skin, and fair trade cocoa butter will ensure your skin stays soft. Fairy Dust / First Snow are glittery loose dusting powders for application on the body over the festive season. Snowman is a milky white shower jelly unusually packed with lemon and bergamot oil and carrot infusion believe it or not. Snow Fairy is loved and revered by many but not me personally. Candyfloss scented shower gels do not not really tickle my personal pickle but I know that many fellow Lushies yearn for the day every year when it comes back in stock. Santa's Belly is a fresh apple juice jelly containing red wine, bergamot oil and star anise infusion. Christingle is a body conditioner that you apply liberally on wet skin in the bath or shower before rinsing off. This contains menthol, peppermint oil, an invigorating spearmint and grapefruit oil for both a citrus and mint hit. I think this would be great in the shower on a cold winters morning to get your circulation flowing. Yog Nog is a soap made with fudgey, toffee esque soap containing soya yogurt, ylang ylang oil, clove bud oil and nutmeg oil. Salt and Peppermint Bark is a peppermint oil infused sea salt solid scrub with a cocoa butter base. I tried this out in store on my arm and my skin felt great so this is definitely on my shopping list. In the lip maintenance department, the usual suspects aka Santa's Lip Scrub (cola flavoured sugar scrub) and Santa Baby (red lip tint) have also made a comeback this year. So that's a very quick whirlwind through the various Hallowe'en and Christmas Lush offerings this year. When I start my Christmas gift guide series later this month, I'll show and tell what is on offer in the gift department.Also keep an eye on my Instagram (totalmakeupaddict) for Lush bath bomb pics and mini-reviews as I plough through the very generous gift that the Lush team bestowed on us a few weeks back. Have you experienced a Lush Christmas yet? If so, tell me what your favourite Lush Winter offering is! I love Lush products and this would have been a great season to check out their stuff! Thx for sharing! I'm definitely going to take a closer look at Lush this year, I don't like anything with glitter but they seem to have a lot of alternatives this year! I can almost smell the bathbombs from just readying this post! Yum!